While the vast majority of military recruiters are hard-working, honest, and dedicated professionals, there are some rare recruiters who are tempted to bend the truth, and/or downright lie, and/or blatantly cheat in order to sign up a recruit. It happens often enough where we've all heard horror stories about military recruiters. Why do some recruiters do this? It's because of the way the recruiting system is set up. It's a numbers game, pure and simple. The military recruiter's job is to find enough qualified volunteers to fill projected vacancies for the fiscal year for their particular branch of service. Recruiters are judged by their superiors primarily upon the number of recruits they get to sign up. Sign up large numbers, and you're judged to be a good recruiter. Fail to sign up the minimum number assigned to you (known as "making mission"), and you can find your career at a dead-end. This policy pressures some recruiters to adopt unethical practices in order to make mission. So, you ask, "why don't the services put a stop to this?" Easier said than done. Each of the services has recruiting regulations which make it a crime for recruiters to lie, cheat, or knowingly process applicants that they know are ineligible for enlistment. Recruiters are punished when they are caught violating the standards. However, the key phrase is "when they are caught." Not that easy to do, as there are usually no witnesses. It becomes a "he said/he said" type of deal. It's not always the recruiter at fault. In many cases, what are reported as lies told by a recruiter are actually cases of selective listening by recruits. A recruiter may say, "Many of our bases now have single rooms for most people," and the applicant may hear, "You are definitely not going to have a roommate." Most recruiters are honest. Few military personnel put in more hours of work per week than recruiters. However, the military is not for everyone. Fully 40 percent of recruits who enlist in the military today will not complete their full term of service. While many discharges will be for reasons beyond the recruit's control, such as medical problems that develop after joining the military. As a First Sergeant for 11 years, I found that a significant number of the involuntary discharges we imposed on first-term recruits was because they simply stopped trying. They discovered that the military wasn't what they thought it was going to be. Many of them told me that the military wasn't even close to what their recruiters told them it was going to be. When this happens, everyone loses. This series is intended to save some of that 40 percent by letting potential recruits know up front, just what they are signing up for. Let's get on with the show! Part 1—Choosing a Military Service: How to decide which branch of the military to join. Part 2—Meeting the Recruiter: Be prepared for your meeting with the recruiter. Part 3— The Enlistment Process and Job Selection: Know about the tests you will take and the qualifications needed for various military jobs. Part 4—Enlistment Contracts and Enlistment Incentives: Learn about the Delayed Entry Program and what the contracts and incentives mean. 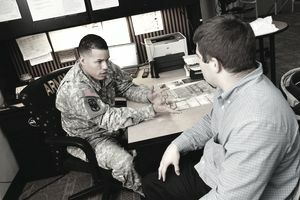 Part 5— Military Pay: What to expect for pay in the military. Part 6— Housing, Housing Allowance, and Barracks: Where and how you and your family will live. Part 7— Chow Halls and Food Allowance: All about meals in the military. Part 8— Education Programs: Learn about the G.I. Bill and tuition assistance programs. Part 10— Assignments: What's the truth about where you'll be stationed for your first assignment? Part 11— Promotions for Enlisted Personnel: What are your advancement prospects in the military? Part 12— Military Medical Care: Here's what to expect for medical and dental care in the military and whether you'll have health care for life. Part 13— Commissaries and Exchanges: Learn about your shopping benefits and limitations in the military. Part 14— Morale, Welfare, & Recreation (MWR) Activities: What can you do for fun in the military?